The Social Cost of Carbon (SCC) is an estimate, in dollars, of the long term damage caused by a one ton increase in carbon dioxide (CO2) emissions in a given year; or viewed another way, the benefits of reducing CO2 emissions by that amount in a given year. The SCC is intended to be a comprehensive estimate of climate change damages that includes, among other costs, the changes in net agricultural productivity, risks to human health, and property damages from increased flood risks. Federal agencies use the SCC to value the social impacts of regulations. 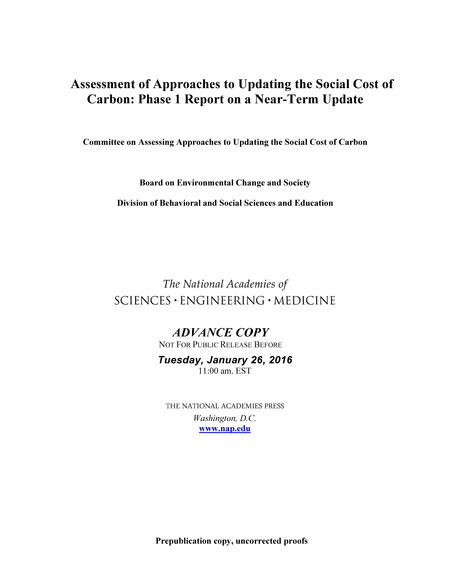 The National Academies of Sciences, Engineering and Medicine, under the auspices of the Board on Environmental Change and Society, has assembled an interdisciplinary committee of experts to review the latest research on modeling the economic aspects of climate change to further inform future revision to the SCC estimates used in regulatory impact analyses. The study was requested by the Interagency Working Group on the Social Cost of Carbon, co-chaired by the Council of Economic Advisors and the Office of Management and Budget. The committee’s work will be conducted in two phases, with an interim report expected from the first phase in early 2016 and a final report in early 2017. The first phase will examine the advantages and challenges of potential approaches to a near-term narrow update to the SCC. The committee’s final report will examine potential merits of a range of alternative approaches to updating the SCC estimates, with the goal of ensuring that the estimates continue to reflect the best available science and evidence, and will highlight research priorities going forward. For the full charge, see the record at the Academies’ Current Project site. Sponsors: Members of the Interagency Working Group on the Social Cost of Carbon, including the U.S. Department of Commerce, Department of Energy, Department of Interior, Department of Transportation, and the Environmental Protection Agency. This report advises that there would not be sufficient benefit to updating estimates of the social cost of carbon (SCC) within a year based only on the revision of a specific parameter in the existing framework used by the government’s interagency group to measure the SCC. The committee considered whether a near-term change is warranted on the basis of updating the probability distribution for equilibrium climate sensitivity (ECS). Because ECS is only one input to the framework used to estimate the SCC, updating the ECS alone may not significantly improve the estimates. The report also recommends ways to change the IWG's technical support documents to enhance the qualitative characterization of uncertainties associated with the SCC estimates, which would increase the transparency of the estimates when used in regulatory impact analyses. Details about upcoming public meetings will be available at this site closer to the date of each meeting. You can also sign up below to receive information about any public meetings and notification of when the reports are available.